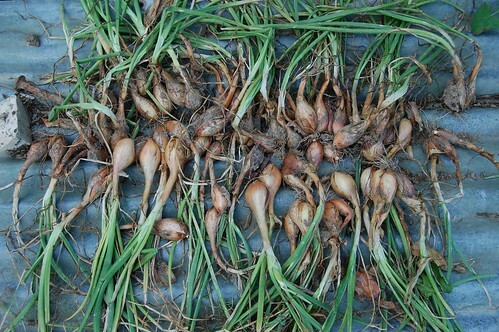 Today I harvested the shallots planted in March. They've done really well. The parent bulbs were saved from last year's crop and strung up in the cold outside store over the winter. Each bulb has produced about six large new bulbs so I can save 15 or 20 for next year and still have a useful amount for the kitchen, which is what it's all about of course. Probably our best year for shallots all the same. We have another variety, bought in this year, on the other plot. These aren't doing so well and will probably make the sort of tiddlers that are only good for pickling. That's o.k. but less gratifying. 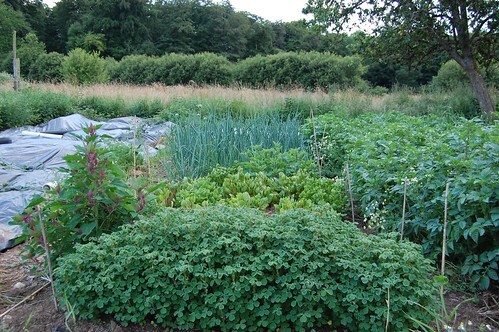 This is a selection of South American plants, oca, ulluco, potatoes and the Magentaspreen (Chenopodium giganteum). The oca and ulluco are doing fairly well although the very hot weather has caused them to stop growing for a while. Plants of the high Andes aren't used to such elevated temperatures. The New Zealand blue potato that I received in a plant swap seems to be about to flower, making it a little later than the Vitelotte noire although this may be due to nothing more than cultural differences. The NZ spud was a tiny tuber and I grew it on in a pot for a few weeks before setting it out in the garden. The Magentaspreen is another self sown weed and I really should get rid of it now before it steals the goodness away from the tubers. Behind the ulluco you can see the other shallots and the onions which are beginning to form bulbs at last. The long row of potatoes are the Pink Fir Apple which are looking good. Fingers crossed that the change in weather won't precipitate any attacks of blight. 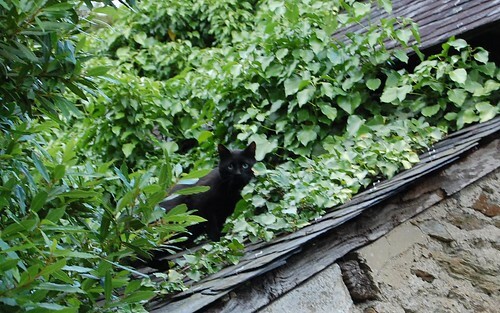 This naughty black cat is no relation at all to the gang of three. It's a feral that has been living in the yard. The first time I saw it I did a double take and had to count the kits milling about my ankles because he or she does look so much like them. This evening there was a standoff between our three and the intruder, who might claim prior occupation I suppose. Not a fight but the sort of staring match cats are so fond of when staking out territory. The obvious name - Jack short for Jackdaw. Your shallot crop looks very gratifying. Such wonderful things you're growing - it inspires me to do better with my own garden. Thanks ICQB, it is pleasing that these did so well. Unfortunately I've just noticed mildew on the main onion crop which might cause a write off. Always something new in a garden.